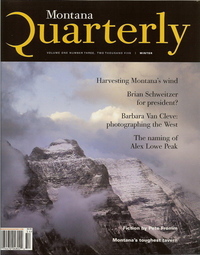 The winter issue of Montana Quarterly just came out with a wonderful article about the sanctuary and our animals. The article is beautifully written and perfectly captures the 'spirit' of the animals here. The piece is illustrated with great photography, too. The headline reads, "Second Chances: Couple's one-of-a-kind ranch provides care and a home for blind and disabled animals." This is the cover of the magazine, and you can find it at both Barnes & Noble and Borders bookstores around the country. In Missoula, you can also find it at the university bookstore as well as at Rosauers. In Bozeman, it should be in the university bookstore. If you can't find it anywhere near you, you can also purchase the issue directly by calling the magazine at 406-587-4491. The editor has graciously given us permission to post the article on our Web site and they are sending us a CD with the digital files, but it may take us a while to get the pages prepared for posting on the Web (they're huge files).